Karen attends hospital births within an hour of Shelby as well as birthing centers in Statesville, Charlotte, Spartanburg and Greenville. She will also attend home births within an hour of Shelby NC. Karen has experience with low to high-risk pregnancies, belly births, medicated and natural births. She also has experience with pregnancy loss and premature births. Every expectant family can benefit from the presence, support and knowledge a doula provides! Families will find extra comfort in knowing their doula is a trained Registered Nurse with past NICU experience. Book your free consultation to find out how Karen can enhance your birth experience! If you have never experienced craniosacral therapy,you're in for a treat! Craniosacral therapy is a relaxing light-touch bodywork that helps to release restrictions in the craniosacral system, which leads to an improved flow of craniosacral fluid. It has been found to help with a myriad of symptoms, including headaches and migraines, back and neck pain, fatigue, earaches, tinnitus, hypersensitivites to smells, joint pain, ADD and much more! Karen is currently offering craniosacral therapy treatments to her clients. Speak to her for details. Labor Doula Services are tailored to meet your needs. Everyone has different needs and desires when it comes to birth! Schedule your free consultation to learn more! ​Payment plans available, if needed! Karen has 10 years of personal experience with her own breastfed babies, including her adopted baby, who breastfeed almost 2 years! She also has over 20 years experience assisting mothers with breastfeeding as a Mother-Baby Nursing Assistant, was a former La Leche League Leader and Neonatal Intensive Care Nurse. Many mothers have found her to be extreme helpful in overcoming breastfeeding issues such as latch problems, milk supply issues, plugged ducts, pumping and much more! Book Breastfeeding Support Services here. *Pricing depends on whether you come to Karen or she makes a home visit as well as travel distance, please contact Karen for details! Urgent, weekend and night services are available! Karen is able to provide FREE breastfeeding support during Carolina Moms Unite monthly mom-to-mom support group meetings. Do you lack postpartum support? Karen can help you! Postpartum care includes: newborn and breastfeeding assistance and teaching, help with light household work (please, no "pre-cleaning"! ), meal preparation (in your home with your food), childcare of older children, etc. mothering your new little one! Book postpartum services here. Karen is the epitome of a doula. Karen was an indispensable asset during my pregnancy, labor, delivery and post partum period. During my prenatal visits - Karen gave me a crash course of the Bradley Method because I was unable to take the classes she teaches. She is a certified Bradley Method Instructor. Not only did she find me a chiropractor that took my insurance but she also helped me put together a diet plan to help with the digestive issues I was having. Both of which helped me to have a much more comfortable pregnancy. I had a false labor trip to the hospital where Karen advocated for me and let me cry in her arms after a traumatic experience. If it wasn't for Karen, I wouldn't have had the courage to transfer my care to a birthing center at 38 weeks pregnant. Karen helped me realize that I would acheive the birth I really wanted if I transferred to a birthing center. My water broke without contractions starting and Karen went out of her way to stay with me during this time and help encourage labor to begin naturally even walking around a park with me for an hour. Once active labor started, it progressed very quickly and was very intense. Karen knew exactly what I needed whether it was the Homeopathics, Rebozo, Tough love, affirmations or just a hand to hold. Karen took pictures and a video of my daughter being born and helped us initiate breastfeeding. She spoke words of encouragement throughout my entire experience. She is very knowledgeable in all aspects of pregnancy, labor, birth, newborn care and medical procedures. If it wasn't for Karen, I am not sure I would have had such an amazing birthing experience. Karen has a passion for mothers and their babies and it shines through every interaction you have with her. She truly loves and cares about what she does, and that makes all of the difference. Her compassion and emotional support cannot be replaced. ~M.C. "Karen’s class was awesome! 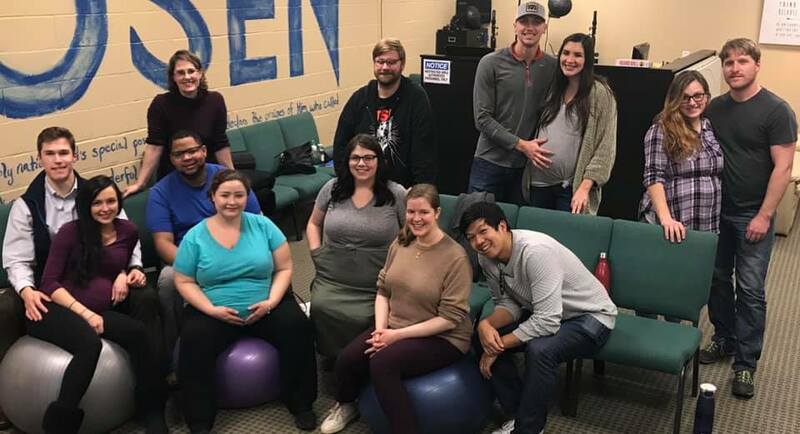 My husband and I really enjoyed the hands on part of the class and it was a wonderful way for us to both feel connected with baby. Karen was very informative and great at keeping everyone feeling comfortable and involved. She gave a lot of great tips for coping with labor. We would for sure recommend her class to anyone whether it be first baby or 6th!" ~J.B. "Took the child birth education classes and they were amazing! Just make sure to bring a notepad due to all the wonderful info you will be learning in just two days." ~R.H. "We are using Karen as Doula for the second time. She is awesome because she is friendly, reliable and stays up to date with current ways to help me. She listens to me and can answer all my nervous anxiety questions and she truly puts my mind at ease. We just took the Above & Beyond Birth Workshop to help get us prepared for the delivery and it was insightful and I really got great recommendations for what I need to do now to prepare for my birth and what would be good to do during delivery and after. The fact that this is the second time I’m going with Karen for doula services should truly say something! She has become a friend I’ll cherish forever. If you are debating on weather or not you need a doula I’d definitely say YES you do she is there for you during pregnancy, during birth, and afterwards for postpartum and that’s something every mom needs weather you realize it yet or not." ~M.C. 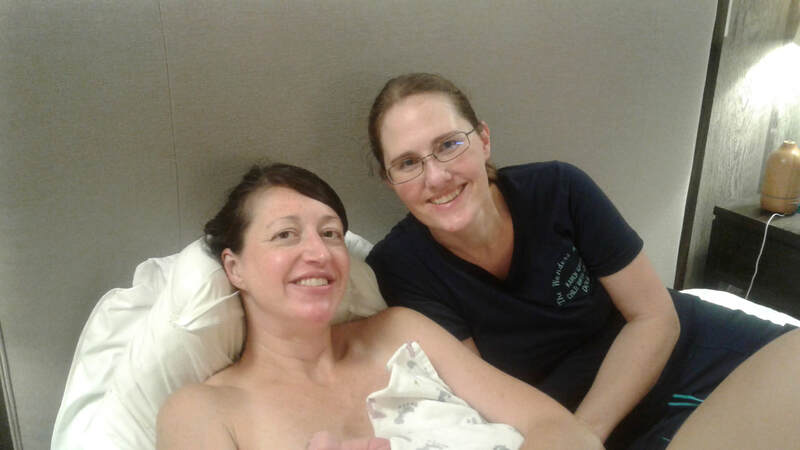 "Having Karen as my doula helped me to have the unmedicated birth I had been wanting. My husband and I took the 12 week Bradley method course that she teaches. My husband was initially leary of 12 weeks of classes. But, after the birth, he realized that this not only gave us the knowledge we needed, but helped us both get comfortable with Karen and for her to know our personalities (and vice versa). She is extremely knowledgeable and helpful about childbirth and pre/post-natal issues. She and my husband worked together very well to coach me through birth. She kept me comfortable, encouraged me to relax, and knew what tools to use at the right time. She explained what was happening, as needed, and answered my questions. She also worked well with the midwife and nurse in regards to what birthing position to try next. Karen has a kind and caring personality (but can be "take-charge" when needed) and a passion for moms and babies. I will forever be grateful for the role she played in the birth of my baby boy." ~W.W. "I don't like to spend money, but I think Karen is one of the best investments I've ever made"~G.D. "Karen is truly amazing!! Her knowledge, techniques, abilities and helpfulness is wonderful! I have had 5 births, #5 the one Karen attended was by far my best! She helped me have my first all natural birth just as I wanted. Her help during prenatal and postpartum visits helped me accomplish tasks I wasn't able to stay on top of! Like dishes and laundry!! I highly suggest anyone who is having baby to hire a doula! Whether its number 1 or 10!! She works wonders! If we have anymore Karen will be by our sides again!"​~R.D. "After my first prenatal visit for Karen's doula services, I told my friends that just that one prenatal visit alone was worth half of Karen's fee. I learned so much from her." ~M.C. "Karen is an absolute blessing! My husband and I not only took her Bradley Method class but she also helped us tremendous with breastfeeding. I honestly don't know what we would have done without her help. She is very patient and truly wants to help. She shares all her knowledge with you and makes you feel comfortable. I highly recommend using her services!" ~A.T. "My husband keeps saying that he would tell anyone taking Bradley Method® classes with Karen that they should also have her as their doula. I can't imagine things turning out so well if Karen hadn't been there" ~W.W. "Karen is amazing! Her knowledge and expertise of breastfeeding, newborns, postpartum care, etc., enhances her already excellent Bradley method classes. Taking Karen's classes really prepared my husband and me for a natural birth; it helped me cope without meds and helped us work together as a team during labor and delivery." ~O.M. "Karen helped me with my labor and delivery and she really helped me control the pain and let my body do what it was made to do. She is very calming and knowledgeable! I am so thankful she was with me for the birth of my sweet baby!" ~K.N. ​"Karen is very knowledgeable and has been so helpful and encouraging to me - patiently answering my MANY questions during my 5 pregnancies (& 4 prodromal labors!) She is a blessing to me!" ~R.H. "I can't express my appreciation for Karen and her Bradley class enough. Karen is a wonderful instructor and a wonderful encourager. She truly made me feel like I could do absolutely anything. Even when my birth went completely off of our plan she was right there to encourage, uplift, and help me see all of the positives in my birth story. She will always have a special place in our hearts. The classes were so informative and empowering. I learned so much about my body and my baby and what they were both made for and capable of. The classes cover so much more than just labor and delivery and a few breathing techniques. They cover postpartum, breastfeeding, infant care and more. Karen makes it fun with games and good conversations. You won't regret taking the classes I promise!" ~A.B. "My husband and I took a Bradley course with Karen in preparation for our first child's birth. As first time parents the information about the natural design of the body and practical application was very helpful. During the birth my husband and I were less overwhelmed because we were able to easily recognize what stage of labor I was in and call upon techniques for that stage. During labor I felt at peace when things felt painful because I could envision my body doing its job to bring my baby to me. As an instructor, Karen was more than willing to go beyond what was in the Bradley workbook and talk with us about our individual situations even after the course ended. When I was diagnosed with Gestational Diabetes her guidance gave me the confidence to discuss my options with my provider and enabled me to still have a beautiful natural birth." ~B.C. Karen’s class was awesome! My husband and I really enjoyed the hands on part of the class and it was a wonderful way for us to both feel connected with baby. Karen was very informative and great at keeping everyone feeling comfortable and involved. She gave a lot of great tips for coping with labor. We would for sure recommend her class to anyone wether it be first baby or 6th!